Jack Gillen was a part of the Miami Sound that started during the 1960’s. He worked alongside innovators like Tom Dowd, Henry Stone, Frank Linale, and Mack Emerman. 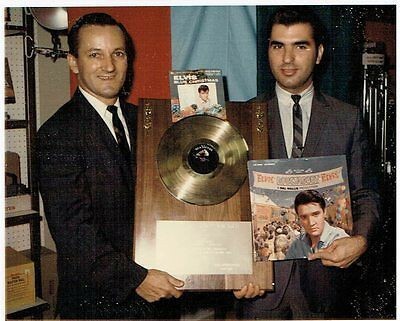 To date, Jack Gillen is the only person in the U.S. to be awarded a gold record for selling the most Elvis Presley records. He would soon shift careers and become a writer. His credentials as an astrologist and author has made it possible for him to publish over 48 books. Jack Gillen is looking to make a post-senior comeback by resurrecting some of the work he’s done in former years. Recently, I got a chance to talk with the expert technician of sound and pen. Come join the conversation. Warlock Asylum: It is indeed an honor to have you as a guest on the news page. It is quite exciting to hear some of your insights. However, for some of our readers who may not be familiar with your persona, please introduce yourself. Tell us, who is Jack Gillen? Jack Gillen: Today, Jack Gillen, who will turning 76 in February 2018, is the same person who was a part of the legendary Miami Sound of yesteryear. Many bands from around the world came to Criteria Studios in Miami. People like Chuck Kirkpatrick, Mack Emerman and Frank Linale help make my career what it was. I learned a lot from Tom Dowd and Henry Stone, who was the Godfather of the Miami Sound during that time. I was just fortunate to be at the right place at the right time, which led to an opportunity to work with some really great people. Warlock Asylum: What was your relationship with Elvis Presley and his management team? Jack Gillen: I was hooked on Elvis from the first day I heard him sing. Tom Diskin had me sit and watch the Welcome Home show in Miami. I was only 18 at the time and wasn’t part of the camp until meeting Gabe Tucker. A few years after meeting Gabe, he asked me if I could work up a method to sell more Elvis Presley records. Gabe admired my work as an astrologer. He said that Colonel Parker didn’t want anyone to know that we were using astrology to help promote Elvis Presley recordings. Gabe was into astrology but Elvis’ wife did not want him near Elvis. Warlock Asylum: How did you get into music production? Did you ever dream of being a recording artist yourself? Jack Gillen: Yes, in high school like everyone else I had my own band. Some of my first records like Treat Me Nice and Don’t Treat Me This Way are still on many albums and YouTube. Warlock Asylum: You worked as a producer for Zodiac International. How did this record company start and with what aims? Jack Gillen: Like Henry Stone, I had other labels that we were trying to sell to a larger company. On one hand, I started recording audio astrology. Records with the blue label dealt with astrology. I also had orange music. The name Zodiac International described the best of both talents, so the label name was written in stone sort to speak. Warlock Asylum: Who were some of your favorite artists released under the Zodiac International record label? Jack Gillen: Wally Futch, Dave Taylor. Sharon Facente and Joni Adams are some of my favorites. Still today after 47 years, Las Vegas by Joni is a deep funk classic! Warlock Asylum: You are also an author and have published quite a few books on astrology. Why did you shift careers and become a writer? Why astrology? Jack Gillen: It came naturally. I was able to set up tour and recording dates for all the bands coming into Miami based on astrology. I went to National Airlines in 1969 with a promo idea called Miami to Las Vegas were they have songs for each city. They loved the Idea but couldn’t give me an advance. I did most of this work out-of-pocket, so I started writing books on astrology worked out better. Warlock Asylum: What are some things that you have enjoyed about being a writer that differs from the musical path? Jack Gillen: As an astrologer, I love seeing the dreams of young bands come true since so many last for a seven-year cycle. As a writer, being able to do research on a subject is the key reward. I am a fan of research. Warlock Asylum: Now after all these years, it looks like there will be a revival of Zodiac International. Can you tell us a little about the current state of the recording company and its latest projects? Jack Gillen: I am looking to publish audio e-books and special albums that bring back recordings that can still be big hits today. Warlock Asylum: What advice do you have to share for those looking to make a career in music and/or writing? Warlock Asylum:Thanks once again for your time. How can fans of your work get in touch with you? Do you have any new projects under way? Warlock Asylum (summary): Thanks so much for taking the time out of your busy schedule to share a piece of valuable music history with us. Your work as an astrologer is deeply appreciated as many of us walk this very same path. We wish you all the best in your spiritual and earthly endeavors. I would also like to send my deepest condolences on the passing of your spouse. Our prayers are with you and your family. Thanks for all the contributions you have made to the human family!